Walking is always a form of exercise I enjoy. Most of the time hubby walks with me. That is something special for me. He will always find a different path. As we walked, this week, we came upon a neighborhood community. ' In the bush, nearest to the street we saw a non poisonous snake sunbathing. It just added a bit more conversation for the day. I have kept off the recent weight loss. Now I hope to get rid of the last ten. Wow you must be in FL still. What a pretty and unusual picture. So happy for you that you've kept it off!! Beautiful snake! You're so lucky to have seen one! We used to have pretty garter snakes in our garden, when we had a vegetable garden. Good luck on losing the remaining ten pounds! Beautiful sight except for the snake...they give me nightmares. Yikes! Poisonous or not, that would freak me out. Way to go getting to the final 10! Oh how I would love to be on the last ten! Keep up the good work! Glad that snake was non-poisonous! Looks huge! Thanks for the encouragement! Spark on! 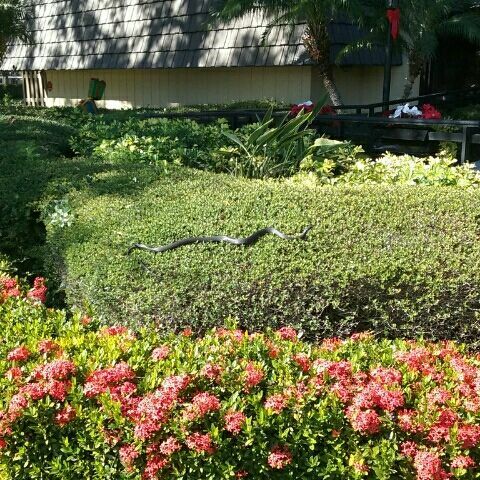 OK if I saw that sunbathing snake I would be walking VERY fast, or even running across the street. Snakes are not my favorite creature, for sure. IT is a great picture and it didn't seem to be too concerned about you walking past. Here's to the last ten! Onward & Downward! Congratulations on keeping it off! We have something in common. Hubby and I often walk together too. A little too cold right now, but when it's nice. Hubby likes to explore a new path as well, so I had better have proper gear. Hiking boots, gloves, hat, walking stick, etc. I never know what interesting path he'll lead me done. Also, I should make an effort to lose about ten pounds. The exercise has improved my strength and flexibility but I'd feel better if I reduced my portion size a bit. Congrats on the weight loss and being so near to your goal. 10 pounds is very doable. I have 8 pounds left but they are coming off sooo slowly. It's great that your DH can walk with you. It's so much more enjoyable to have someone to talk too. Makes the time go by quicker. Great job on the weight loss, Linda! During the warmer months, hubby and I often walk together, I always enjoy that, too. With the snow now, it's back to the treadmill most days. So glad you walk with your hubby, nice to do something active together! Good photo of the snake, great to know it was harmless!!! When I think of my other Florida friend running by alligators and such, makes me appreciate how 'safe' the creatures here usually are! Good luck with the last ten, so close!! You and your hubby are doing a great job! Those last 10 can be pesky, but you can do it! Yes, walking is a very special bonding experience; that's how I developed my love for walking. My grandfather and I always walked when I was a child. Those are very special memories for me. Congrats on keeping your losses off and I know you'll be rid of the last 10 soon. The last 10 are the hardest! You can do it! You are truly inspiring!!! Great job and kudos to your husband , mine won't walk with me he says I walk to fast !